Treats cold and flu symptoms. And, it’s easy to grow indoors or out. Ginger loves it hot, humid and shady. Think of its natural environment – it’s an understory forb in lowland tropical forests. That landscape is soggy and well drained. In a pot, the soil should be damp and well drained. Different species can grow from 3-15 feet in height and about 3 ft. wide. 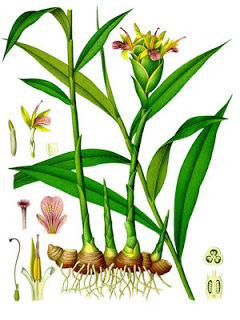 While its flowers are exotic, it is the underground stem, the rhizome, that packs the medicinal and flavorful punch. Soak it for a few hours and lay it on the soil, then just cover it with more soil. Some folks will add worm castings or other organically rich material to the mixture. Most importantly, the soil must remain moist and drain well. The best soil pH for ginger is slightly acidic, between 6.0 and 6.8. Keep it at or above 75 ºF (24 ºC) and 70-90% relative humidity (RH). It’ll take several months for your plant to reach its full height. Depending on conditions, that can be between 4 and 10 months. You can begin harvesting it when you see little nubs at the soil line. Cut off the portions at the edge of the pot, rather than near the center. Then, like the above video recommends, make your tea or spice your meals with it. This piece originally appeared at Activist Post.